How do you put into words the way you feel about your best friend… the best dog you’ve ever had…. the one you’d be lost without? I just can’t, so I guess I’ll just tell you her story. It was a few day after Christmas 1999, and we had just rented our first house. We already had Molly, but as much as I love her, I’d always wanted a more typical Dane. (Molly is not very big due to poor breeding and health problems as a pup.) I had heard of a private breeder with puppies a few towns away, and talked my hubby into letting me go take a look. This was quite an accomplishment back then as Jake was not the Great Dane nut that he is today. Well I went to the breeders house and bought the only merle in a litter of mantles. She was the cutest little thing. All grey and black with a bit of white on the chest. I fell in love immediately. We went home and got her acquainted with the family…. all went well. We’ve had a happy and relatively healthy life together so far. I say relatively, because in 2000 when Athena was spayed, we discovered she has vonWillebrand’s Disease. It is a bleeding disorder very similar to hemophilia, but usually milder. I picked her up from the vets and when she sat down in the car her incision sprung a leak. It was the scariest thing in the world to see the blood squirt out in a mini fountain. It took 2 days to stop the bleeding. 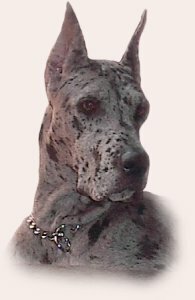 Athena does obedience and has aspirations of honing her skills and one day traveling to the Great Dane National to show off her stuff. She has her Canine Good Citizen certification and her Therapy Dog International certification and loves to visit our local schools. 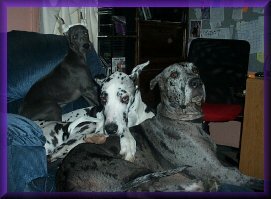 Athena is a testament to her breed.. Everything a Great Dane should be…. smart, beautiful, loving, and a wonderful friend. I thank God everyday for the gift He’s given me in her.